The U.S. had a cooler and wetter than average spring that featured deadly tornadoes in Oklahoma, widespread flooding in the Midwest, and deepening drought in the Western U.S., according to the National Oceanic and Atmospheric Administration (NOAA). In a report released Thursday, NOAA said the March-through-May period was the coolest such stretch since spring of 1996, ranking as the 38th-coolest spring on record despite a warmer-than-average May. The season was especially notable for its exceptionally cold and wet start in the central part of the country, with many cities, from Bismark, N.D., to St. Louis and even Richmond, Va., receiving more snow during the meteorological spring months than they did during winter. Fourteen states, from Minnesota to Georgia had a spring that ranked among their top 10 coolest on record. 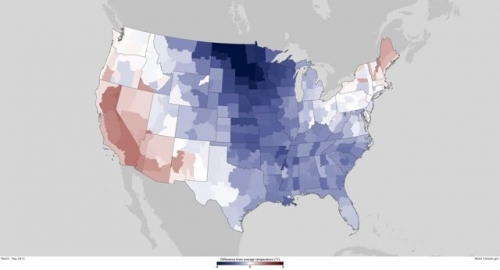 Temperature departures from average during spring 2013. Many cities broke all-time spring snowfall records. In Duluth, Minn., 76.6 inches of snow fell from March through May, compared to the average of 20.5 inches during the same period, and the 41.5 inches that fell during last winter. In Fargo, N.D., 31.3 inches of snow fell in spring, compared to the seasonal average of 12.1 inches. According to the Rutgers University Global Snow Lab, the spring snow cover extent in the U.S. was the largest since 1984, and the eighth largest on record. Spring also widened the already gaping divide between the haves and have-nots in terms of rainfall across the lower 48 states. Record amounts of rain fell in parts of the Midwest, while record dry conditions set in across the West. In Colorado and New Mexico, extremely dry conditions are already contributing to escalating wildfires and dust storm hazards. In Oklahoma, the gap can be seen within the state, where the eastern portion suffered from flooding this spring, but the western section of the state is dry and dusty. 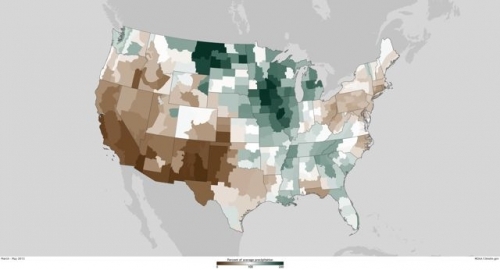 The Midwest and Northern Plains were the wettest regions of the U.S. this spring. Iowa had its wettest spring on record with 17.61 inches of precipitation — 8.63 inches above average. Five states in the regions had one of their 10 wettest springs, and that contributed to destructive flooding along the Mississippi and Illinois Rivers, among others. Iowa, Illinois, and Michigan also had their wettest January-to-May periods on record. Yet across the West, and especially in the Southwest, rainfall was extremely scarce. Spring temperatures were warmer than average as a multi-year drought showed no signs of abating. In New Mexico, just 0.66 inches of precipitation fell, which was 1.72 inches below average, NOAA said. California had its eighth-driest spring on record, leading drought conditions to envelop nearly the entire state. Largely because of extremes in below-average temperatures, one-day precipitation extremes, and the large drought footprint across the West, the U.S. 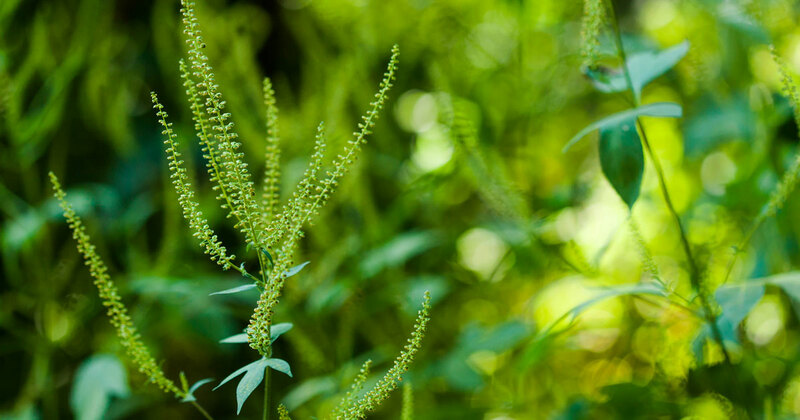 Climate Extremes Index was 1.4 times its average value during spring, NOAA said. 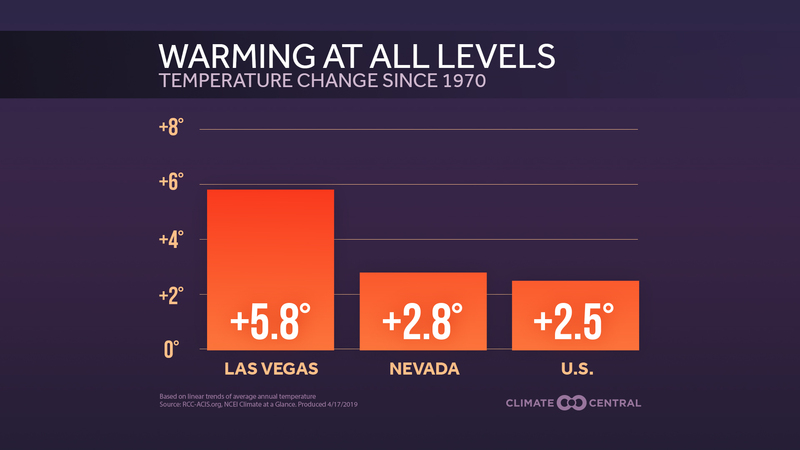 The index measures the highest and lowest 10 percent of extremes in temperature, precipitation and drought across the lower 48 states, and has set records in recent years as extreme weather and climate events have struck the U.S. at a dizzying pace. Precipitation departures from average during spring 2013. Although there have been fewer tornadoes than average so far in 2013, the spring will long be remembered for the two deadly EF-5 tornadoes that struck the Oklahoma City metro during May. One of those twisters, which tore through the city of Moore on May 20, killed 23, and the damage is likely to rival the most expensive tornado in U.S.history, which wiped out parts of Joplin, Mo., in May 2011. The other EF-5 tornado struck just 11 days later in El Reno, Okla., and it had estimated winds of more than 200 mph and a width of 2.6 miles, the widest tornado ever recorded on Earth. The most powerful tornadoes, ranking as either EF-4 or EF-5 on the Enhanced Fujita Scale, are rare — they comprise less than 1 percent of the total number of tornadoes — yet they are the most reliable killers, accounting for 70 percent of tornado fatalities. The two Oklahoma EF-5 tornadoes were the 59th and 60th EF-5 tornadoes on record in the U.S. since 1950, and were just the seventh and eighth to occur in the Sooner State. Severe Storms Bring More 'Weather Whiplash' to U.S.